Blood Harmony. Whether it’s The Beach Boys, Bee Gees or First Aid Kit, that sibling vocal blend is the secret sauce in some of the most spine-tingling moments in popular music. 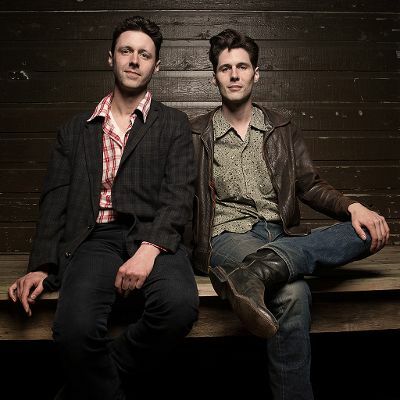 The Cactus Blossoms – Minneapolis-based brothers Page Burkum and Jack Torrey – offer compelling evidence that this tradition is alive and well, with a deceptively unadorned musical approach that offers “creative turns of phrase, gorgeous harmonies, and an ageless sound” (NPR All Things Considered), not to mention spine tingles aplenty. Their 2016 debut You’re Dreaming, a stunning and transporting collection of original songs, earned high praise from Rolling Stone and Vice Noisey, tour stints with Kacey Musgraves and Lucius, and a perfectly cast performance on the third season of David Lynch’s Twin Peaks. Now their unlikely rise continues with new album Easy Way, to be released on their own label Walkie Talkie Records. While many bands would have been content to stick with the winning formula of their debut, the Blossoms refused to repeat themselves. If You’re Dreaming celebrated their vintage country and rock influences, Easy Way reveals a songwriting style that has changed, evolved, and gotten more modern. Dan Auerbach, another artist who knows from bedrock influences, co-wrote two songs on the album. “Dan’s love for songwriting was inspiring, just the kick in the pants we needed to start writing again after being on the road,” says Page. The brothers’ decision to produce the new album themselves no doubt led to the new sound. “We wanted the freedom to experiment with our own weird ideas,” says Jack, “We used to joke that the working title album should be Expensive Demos.” As they crisscrossed the nation on tour, the brothers would stop through Alex Hall’s Reliable Recorders studio in Chicago to chase the new sound they were after. The result joins together what would otherwise be distant corners of the American songbook. Both the traditional twang of Chicago pedal steel guitarist Joel Paterson (Devil in a Woodpile, The Western Elstons) and the primal wail of free jazz saxophonist Michael Lewis (Bon Iver, Andrew Bird) are at home on the album. Just as they did with their debut, the brothers found a voice all their own.